I'll reiterate what at least one person said in response to the prior post that Terra Nova seems to have a young, vibrant spiritual community - from my sporadic interactions with them. ^What she said^ Or Grace Fellowship (My personal recommendation). Trinity United Methodist on Lark Street. There's quite a few young people and young families - lots of graduate students and some young professionals (teachers, lawyers, professors). Perhaps a slight word of warning: While this might or might not matter to Liz, it seems that some of these churches with younger congregations might not always be progressive at the same time. 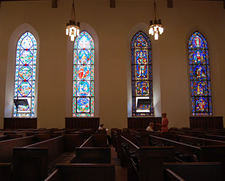 There are older congregations with more progressive stances in the area such as both 1st Pres churches in Albany and Troy as well as the Universalists. I have run into the same problem that James at 46 mentions. The churches with younger congregations tend to be fundamentalist Christians which does not fit with my more liberal values. Right now I am exploring the Unitarian Universalists in Schenectady but there are definitely not a lot of young people. If you are more fundamentalist-leaning NorthStar church in Clifton Park has a lot of young people and a very vibrant pastor. As far as Roman Catholic churches, St Vincent de Paul's on Western Ave. has a very diverse and vibrant congregation - and as far as Catholic churches, they are very progressive-minded, much more so than many other Catholic or even Protestant churches in the area.They seem to be right in line with Pope Francis's more open-minded (and open-hearted) conception. Not sure what area of the captial region Liz is looking to find a church, but for folks in the Niskayuna area, I've been happy to discover Niskayuna Reformed Church on Route 7. It's more progressive theologically/socially but with a more traditional worship style, as with most of the old world denominations. I'm most familiar w/ Presbyterian churches and this seems very similar in style and substance. As to the desire for a church that skews younger. There is a healthy number of younger folks, families, and kids at this church (they just built a great new playground this year on the property! ), though there are plenty of older folks too. It feels like a church that isn't catering just to "young people" but is also not dying off because there are no younger adults with families bringing their kids up as part of the church. Everyone wants something different, but in my opinion, I don't want a church full of people my age, but I do want a church that seems well-represented across the board, with people at all stages of life. Just something to think about to those who are looking.. I'm also interested in a young, progressive church, but I've been turned off by UU churches in the past. The congregations tend to be older. I grew up in a young, active, fundamentalist church, and I'd love to find something more liberal and open-minded. Any suggestions? I'm beginning to think that people in their mid-twenties who think the same way I do just don't go to church! Having attended Terra Nova, I loved the church, but many of the others mentioned here are solid as well. Best of luck, Liz! Glad to see such thorough answers here on this thread. I will preface my comment with a caveat - I have never actually been to this church - but when I read the question, I thought of the same church Brian mentions, Christ's Church. I know a number of young families who have joined, included a couple of families that used to belong to the UU church in Albany. They don't have a building - they meet in the Elks Lodge behind The Point and Juniors on Madison Ave. As a resident of that neighborhood, I will say that I have been impressed with this church actually doing what Christ teaches. They are new but have already served the community in a number of ways. I have been to a couple of events that they have put on or sponsored in the community, and the minister and parishioners have always been very welcoming, but there is no prosletizing beyond them announcing where they are located and when their services are. I have gone to Grace Fellowship for a number of years and there are a lot of young people there, but they can be a bit hard to find as there is currently no young adult ministry (though there are plenty of other areas to get involved). Grace Fellowship has a location in Half Moon that has a monthly young adult meeting that you may be interested in.